The chances are that if you are comfortably (or stagnantly for that matter) working in an organisation and don’t think of moving elsewhere you don’t even remember what your CV looks like. If, on the other hand, you are considering a move and looking around for new opportunities your CV is probably the first thing you turned your attention to. That’s what I’ve done many times and came to realise that I have made a mistake and at best should have done it the other way around. Let me explain. CVs are a poor recruitment tool. the magic belief in keyword matches. Surely two years of experience with Jasmine, three writing WCF applications and ten with .Net correlate directly with your abilities as a developer and your performance in a new organisation. (Well, they might correlate, although personally I have seen no evidence, and if they did it would only affect 5% of one’s performance, right?) And finally, having a piece of paper stand in for your experience, abilities and attitude feels to me a little like going out for a dinner with a picture of your partner. Bob has a few more thoughts on the subject with the #noCV campaign. I’m in. I still find a CVs useful. While I don’t believe in CV being a useful recruitment tool others do so I still have and maintain one. I found it can still be useful for me. I don’t however update it before I start a search for a new job. I update it after I have found one. As soon as I’m in I take some time to write down a new entry on my CV for the job that I’m about to start. I write down things I hope to be able to do, outcomes I aim to achieve, results I want to deliver. I provide a specification and a direction for myself to follow. Then I go back to what I wrote. I check if I’m on course, I validate if my initial assumptions where correct and with any new information I gain I rewrite my entry. This allows me to see more clearly when it’s time to move on – it’s simply when I can’t achieve what I wrote I would – or I did and there is nothing more to write. Now with a new entry started I’m now ready for new challenges tomorrow morning. new course, conference, starting a new job etc. I no longer care about the 2 pages rule. I have noticed that most CV I see at companies don’t follow that rule either. 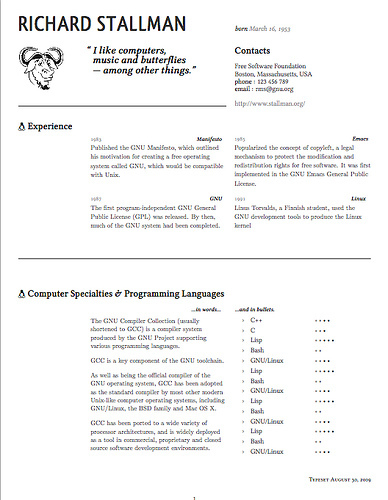 I used to filter a CV for a specific job, but a lot of companies keep (electronic versions) of my CV around. then I prefer a non filtered one. My cv is really bad, I try to improve the layout about once every 6 months, but I don’t invest a lot of time in it as long as it’s enough to find jobs. And more and more I don’t need to send one, linkedin or my reputation is enough. a nice post. I agree with Bob’s #noCV campaign too and have helped at least one person get himself a job this way. What was on his LinkenIn page, plus his GitHub account proved more important than the traditional CV. So that works well for a dev, and as Yves points out similar types of ‘profile’ help people to leave a trace of their actions, beliefs and reputation online so the CV becomes redundant. The CVs only role is to ‘monitor’, as you say, our own goals and provide a template for insitutions/organisations that haven’t learned the new ways yet. For myself, I still keep one for work as it’s needed for promotions and appraisals, and then the longer the better. Maybe one day it won’t be needed, but I’ll not hold my breath on that one. « What’s wrong with the Retrospective Prime Directive?